Whether your visit to Westport is for leisure or business, we would love to be your hosts. We offer quality ASURE rated 4 star self contained and serviced accommodation. Experience our unique West Coast style and service and make your visit to Westport one to remember.We offer clean, warm, comfortable and tastefully decorated units to suit all groups of travellers, ranging from studios to 2 and 3 bedroom apartments with 2 bathrooms. Some of our units feature spa baths for your complete relaxation after a day of travelling, exploring, sight-seeing or work. All of our units feature original photography by the owner. Secure wireless internet is available.The Northern West Coast/Buller region is bounded by two National Parks – Paparoa and Kahurangi – and is home to many unique must-see attractions. If your itinerary allows, we strongly recommend that you consider a stay of at least two nights in order to take in as many of these as possible. Sunny north facing studio units with queen size bed . Upstairs units with a sliding door to a sunny balcony with outdoor seating. Cooking facilities include microwave, electric frypan, ceramic cooktop with two hotplates and tea/coffee/making facilities. Great selection of teas and coffees including Tuatara plunger coffee. One queen bed and one single bed. Cooking facilities include microwave, electric frypan, ceramic cooktop with two hotplates and tea/coffee making facilities. Great selection of teas and coffees including Tuatara plunger coffee. Units are either on the ground floor with a sliding door to a private courtyard or upstairs with a sliding door to a balcony with outdoor seating (preference if stated will be accommodated if possible). King size bed. Bathroom features large corner spa bath with a shower over. Cooking facilities include microwave, electric frypan, ceramic cooktop with two hotplates and tea/coffee making facilities. Great range of teas and coffees including Tuatara plunger coffee. The spa studio units are on the ground floor room with a small private courtyard, situated at rear of property away from main road. Double glazed. Queen size bed in spacious lounge area and twin single beds in the bedroom. Single spa bath with a shower over the bath. Cooking facilities include microwave, electric frypan, ceramic cooktop with two hotplates and tea/coffee making facilities. Great range of teas and coffees including Tuatara plunger coffee. 32"CD TV. Queen size bed in spacious lounge area and twin single beds in the bedroom. Cooking facilities include microwave, electric frypan, ceramic cooktop with two hotplates, tea/coffee making facilities. Great selection of teas and coffees including Tuatara plunger coffee. 32" LCD TV. 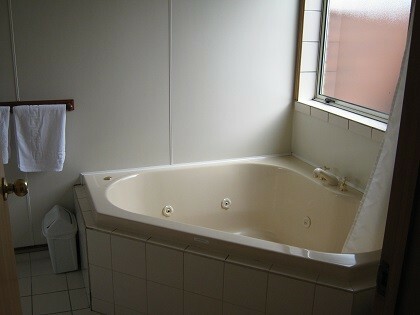 Ensuite bathroom has a shower over a single spa bath, hairdryer. One queen bed in a separate bedroom, one queen bed in the lounge area. Cooking facilities include microwave, electric frypan, ceramic cooktop with two hotplates, and tea and coffee making facilities. 32" LCD TV. Separate bedroom has a queen size bed and the en suite bathroom has a shower cubicle. Spacious lounge/dining area, 32" LCD TV. Cooking facilities include microwave, tea/coffee making, electric fry pan, ceramic cook top with two hotplates and tea/coffee making facilities. Great range of teas and coffees including Tuatara plunger coffee. Ideal for families or two couples, this spacious apartment style unit on two levels also has two bathrooms - downstairs with toilet and shower, upstairs with a shower over a large corner spa bath, and toilet. Lounge/dining area on ground floor has a 32" LCD TV. Both bedrooms have king beds, second TV in upstairs bedroom. Extra single bed on mezzanine area. 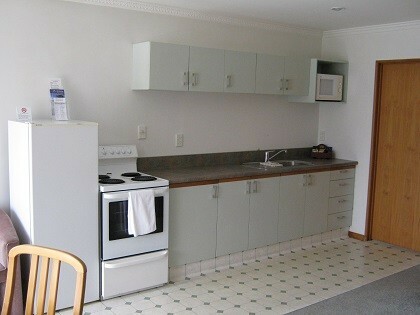 Full kitchen includes a microwave, tea/coffee making, electric frypan and free standing cooker with oven. Spacious two level apartment style unit, great for larger family groups or families travelling with grandparents. One bedroom downstairs with twin single beds. Two bedrooms upstairs, one with king bed and TV, one with twin singles. Bathrooms on both levels with shower and toilet. Spacious lounge/dining area on ground floor with 32" LCD TV. Full kitchen facilities include microwave, electric frypan, tea/coffee making, and free standing cooker . Beds upstairs can be made up as a king or two singles to individual requirements - please advise on booking. 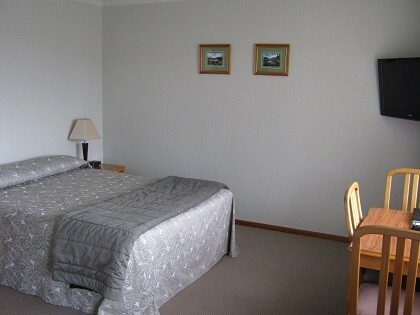 Spacious two level apartment style unit, great for larger family groups or families travelling with grandparents. One bedroom downstairs with twin single beds. Two bedrooms upstairs, both with king beds, second TV in one bedroom. Bathrooms on both levels with shower and toilet. Spacious lounge/dining area with 32" LCD TV. Full cooking facilities include microwave, electric frypan, tea/coffee making and free standing cooker. 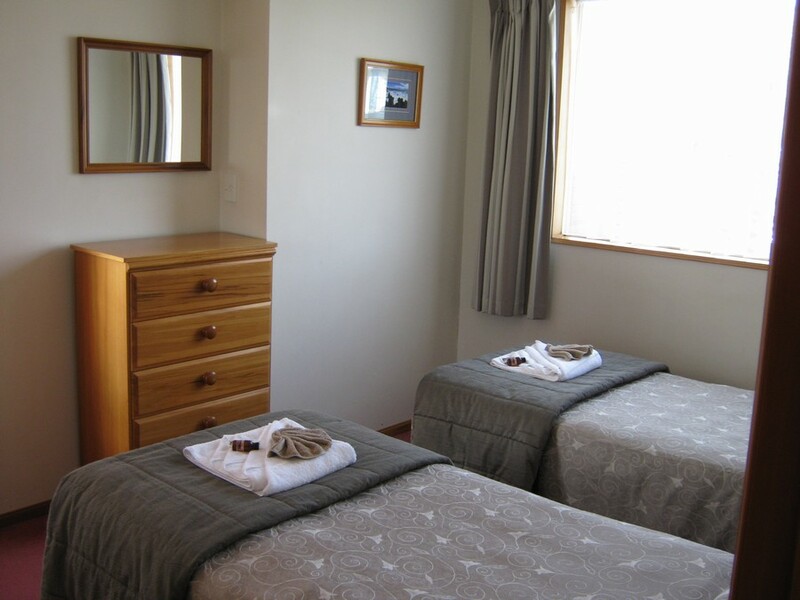 Beds upstairs can be split to two singles to suit individual requirements - please advise on booking.